I’m delighted to welcome Richard Wall to my place with a fascinating blog about living- and writing- with the duel influences of American and British culture. The USA has been in the news lately for all the wrong reasons. A new president who comes across as petulant, ignorant and divisive, and a spate of mass shootings is giving a great nation extremely bad press when it comes to world opinion. As ever, the actions of the “few” has created a backlash of bad feeling towards the “many” – ordinary Americans just trying to get on with their lives. America, it seems, is like Marmite. But whether you love the place with a passion or hate it and all it stands for, there is no denying the huge cultural impact the United States has made on life in Great Britain since the end of WW2. Opinion varies as to whether this is a good thing or not, but what follows is my personal viewpoint. 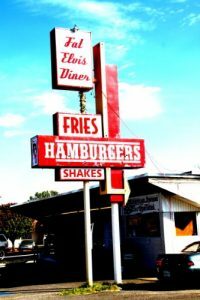 As a writer, people often ask me why, as an Englishman, my stories contain so many references to American culture. Well, you could say I had no choice in the matter! Despite growing up in the backwater of a small market town in rural Herefordshire, I’ve been around Americans all my life. My earliest memories are of watching John Wayne movies on our old black and white TV, and then playing cowboys and indians (I always wanted to be Geronimo, leader of the Apaches). I watched Neil Armstrong step onto the moon and news reports of the Vietnam war. There were also countless US TV shows: Champion The Wonder Horse, Casey Jones, Bonanza, Kojak, Starsky and Hutch, The Rockford Files, M*A*S*H, Taxi, and many more. American writers, such as: Stephen King, Andrew Vachss, Elmore Leonard, John Steinbeck, and Langston Hughes (and lately Ran Walker), added layers of depth and context to my TV and film influences, and gave me an ear for US colloquialisms. When I finally realised my dream and visited the USA (Florida, and Rhode Island, courtesy of a nuclear submarine), I found it every bit as cool and exciting as I imagined it to be as a child. Since then I have returned many times; visiting California, Oklahoma, New Mexico, Texas, Colorado and including one memorable road trip through Tennessee, Arkansas, Louisiana and the Mississippi Delta, visiting blues heritage sites and seeing with my own eyes the places where my blues heroes were born, lived and died. All of these lifetime influences have been bubbling and fermenting in a cultural stew that I hope adds flavour to my writing. An Englishman in Oklahoma is watching a storm approaching when he receives an email on his phone. As he waits for the email to download, it causes him to reflect on his childhood in 1970’s England, his relationship with his father and the journey that brought him to the USA. 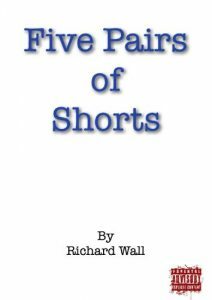 ‘Five Pairs of Shorts’ a collection of short stories, some with strong American influences, followed soon after. 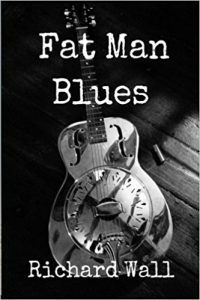 In 2015 came my first novel, Fat Man Blues, inspired by the Mississippi road trip, and which has attracted a great deal of interest (and praise) across the world since its release. Fat Man Blues has opened the doors to a fascinating world where I have been extremely fortunate to meet and become friends with talented and creative people from across the planet. Vince and Stu’s road trip through Texas is cut short when Stu’s ancient Honda breaks down in the quiet town of Rambling. Nearby is Bubba’s used-car lot, containing a collection of classic American cars. Following a bizarre encounter with a talking crow, and a deal signed in blood, Stu trades in his Honda for a powder-blue 1952 Cadillac convertible. Back on the road, the two buddies continue their journey in style, until a series of Burma Shave road signs and an encounter in a cemetery changes things forever. This was inspired by a road trip with friends, from Oklahoma City to Colorado, which took us along parts of Route 66, where glimpses of the America from my childhood imagination can still be seen. 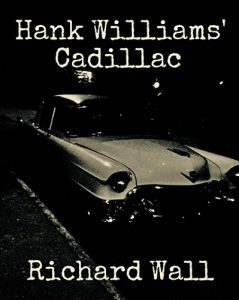 By the way, the cover photograph (taken by me in 2012) features the beautiful 1955 Cadillac in which we took a tour of Memphis. The American influence continues with another short story due to be released at the end of the year. 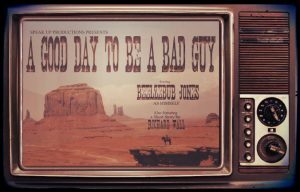 Beelzebub Jones will accompany the spaghetti western-themed concept album of UK Blues Man, Andrew ‘HalfDeaf’ McClatchie. So, America. Good guys or bad guys? Well, my personal view is that I’m British and proud to be so, but I can also speak American, because I grew up with it. At the end of the day we are all just people. Ordinary Americans just want a quiet life, like we all do, and are among the friendliest people on the planet. Many thanks for sharing your blog with us today Richard. Great stuff. Two countries separated by a common language, Richard? I’ve lived in the States and visited many times. I love the country, and the people. Well, most of them!